Fuel your outdoor adventures with these vegetarian dehydrated meal options. Our handy list includes freeze-dried options for breakfast, lunch, and dinner plus snacks to help keep you well fed during your camping, hiking or backpacking expeditions. 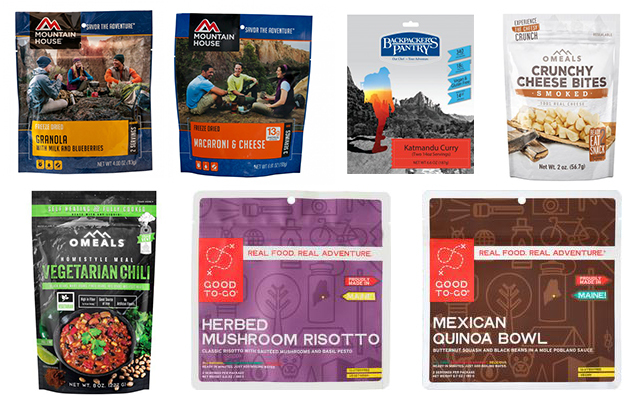 Dehydrated food brands like Mountain House, Backpackers Pantry, Good To-Go, and Omeals are all great options for those looking to enjoy a well-rounded meal during their outdoor adventures. Freeze-dried meals are a convenient solution since it only requires water and a heat source to prepare. Once you have boiling water, most of these options take less than 10 minutes to prepare from start to finish. Freeze-dried meal pouches are a great option if you are trying to pack lightly, as they don’t take up much space and are lightweight to carry. Most meal pouches feed up to 2 people, depending on how hungry you are. I put together this thorough guide of Vegetarian Dehydrated meal options for breakfast, lunch, and dinner plus snacks. After a day out on the trails, hiking or exploring you can enjoy a tasty, warm, and healthy meal while sticking to your vegetarian diet thanks to these options. Most of these packaged meals have a shelf life of 2 to 5 years and make great options for an emergency food supply as well. You know the old saying, “breakfast is the most important meal of the day,” well it’s especially true when you’re fueling yourself up for a day of adventures. Depending on your dietary restrictions and diet needs, there are great options available for vegetarians. Kick your day off with a high-protein meal like the Backpacker’s Pantry Colorado Omelet – all-natural, cage-free eggs with cheddar cheese, bell peppers, and onions. A spicy well-balanced breakfast with all-natural, cage-free cages mixed with black beans for some added carbohydrates. This Organic Oatmeal from Backpacker’s Pantry is packed with healthy carbohydrates to fuel your day’s adventures. Good To-Go’s Oatmeal breakfast adds protein in the form of Chia and Hemp Seed Hearts, plus cinnamon and turmeric for their anti-inflammatory qualities. The Mountain House Granola with Milk and Blueberries is a great option when you want to start your day with something sweet. It also makes for a great snack or even dessert. When you are camping, it’s important to refuel your body properly for all of the physical activity you are doing. It’s important to give your body enough calories and macronutrients to keep you feeling energized during your adventures. Depending on your dietary needs and personal taste, there are many great options for dehydrated vegetarian meals to enjoy for lunch or dinner. Who doesn’t love Mac and Cheese? Both adults and kids love this classic meal that’ll make you feel right at home no matter where you are. The Mountain House Pasta Primavera features a healthy mix of real vegetables mixed in a creamy cheese sauce. Taste the tropics with this hearty meal from Backpacker’s Pantry. This Cuban-inspired dish combines the flavors of black beans, rice, coconuts and bananas. Katmandu Curry is a vegetarian curry made with lentils, vegetables, and potatoes making for a great nutrient and calorie-packed meal. A high in protein and fiber meal that’ll help you refuel after a long day outdoors. The Wild West Chili from Backpacker’s Pantry packs a little punch of heat to warm your belly. The Three Sisters Stew from Backpacker’s Pantry is similar to a traditional meatless chili but adds in some extra vegetable goodness to add some vitamins and nutrients to your meal. A creamy and hearty meal for the great outdoors. This classic risotto is made with sauteed mushrooms and a basil pesto. A filling Mexican Quinoa bowl packed with vegetables such as butternut squash and black beans finished with a savory Mole sauce makes for a tasty yet exciting meal after a day on the trails. If you’re looking for a little bit of spice after your adventures, the Good To-Go Indian Vegetable Korma is a great option. This curry dish packs 390 calories per serving, which can be tough to find with vegetarian meals, so it’s a great option for refueling after those tougher days outside. Packed with vegetables – like beans and peppers the Omeals Vegetarian chili is full of fiber and will leave you feeling full but not heavy like a traditional chili would. The Omeals Pasta Fagioli adds protein by adding a Soy crumble and beans to this classic Italian comfort food. Reward yourself after a day outdoors with some sweet treats. This slightly-sweep apple crisp is made with real apples and granola and cooks in just 5 minutes! These individually wrapped all-natural peanut butter packets are a great high-calorie snack to carry with you on your adventures. Perfect with celery, crackers, bananas or on it’s own. A great snack with peanut butter or cheese wiz! These crackers have a 25+ year shelf life, making them a great option for a long-term food supply. These Cheese Bites from Omeals are available in three different flavors – Original, Smokes, and Honey Habanero. High in protein and a good source of calcium make for a yummy treat on the go. With a variety of different meal and snack options available, vegetarians with all types of dietary restrictions and flavor preferences can stay happy and well-fueled during outdoor adventures.